It's the first Monday in March you know what that means, another Monthly Aspirations Link-up. Spring is just around the corner so it's perfect for a fresh new start and new goals. 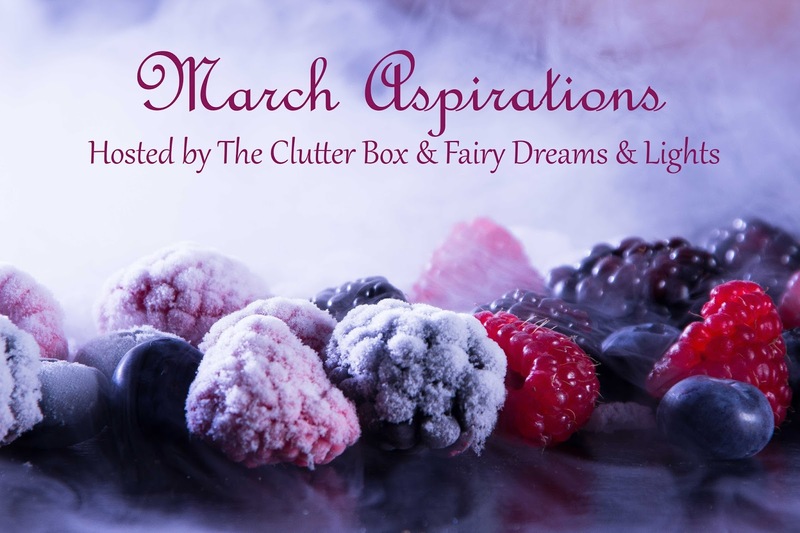 Monthly Aspirations is a monthly goal link-up hosted by the wonderful Angela over at The Clutter Box Blog and me. The Monthly Aspirations Link-up happens the first Monday of each month and will be open for two weeks. So there’s tons of time for you to come back and share your goals with us. It’s a safe place to share what you want to accomplish each month. Our goal with his link-up is to support, encourage, and motivate each other. We’d love if you’d share your goals with us and join the party by adding your link below. Thank you to everyone who shared their goals last month. I'd like to make a special mention to Courtney from Courtney's Little Things. I love the way Courtney sets up her goals. She picks the top things she wants to work on for the month and only takes on what she can handle. I think it's such an effective way of ensuring that you're able to achieve your goals. She had some amazing goals last month that I actually wanted to work on for this month too. I'd love if you go send her some love and check out her blog. For January and February, I liked the idea of my goals having a theme something that was unique to that particular month. This month I don't really have a theme I just choose some goals I really want to work on. I actually read a book last month for pleasure, which in my case is rare since I'm always busy. I never have time to read like how I used to. I realized that I have to start making that time. There're so many books on my shelf that I bought and haven't read along with so many books on my must reads list. I'd like to slowly read all of them. It really felt nice reading something that I was interested in again not just boring textbooks. So my goal last month was to exercise which didn't happen. First I didn't really have an exercise plan of what I wanted to work on or how long. Then I didn't know where in my schedule I was going to fit this. So I just tanked my goal for last month. That's why this month I want to focus on those two things. Figure out what I'd like to do and when I'd like to do it. That way I'm one step closer to achieving my overall goal towards a healthier lifestyle. I've been thinking of starting journaling. I'm great at the traditional journals where you talk about your day and feelings. So I've been looking into bullet journaling. I have a few things I need to know first before I actually start doing it. Therefore, I need to make time for more research and ideas on how I'd like mine to look. Hopefully by the end of the month, I can start. Last month I completely abandoned my blog duties because I couldn't handle all the workload. So this month I'd like to figure out ways I can balance the two. I love blogging and I love being able to write a blog post for you guys. So I'd like to keep doing that while being able to excel in school as well. It's always been a hard balance for me but I'd like to come up with ways to make it easier. Most of these goals are just small steps towards one bigger goal. They're things that I haven't given up on yet and this way I'm hoping they'll be more achievable. What are your goals for this month? Join the party and add your goals in link-up below.